Finding a snake inside your home or crawl space can be a truly terrifying experience. Many people have an extreme fear of snakes, whether the snake is dangerous or not. 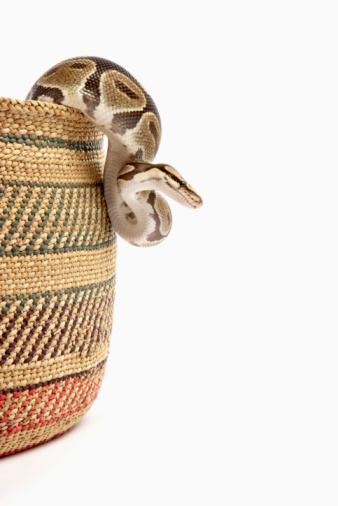 Snakes usually invade a home or crawl space in search of food, which often includes rodents. You can take steps to repel snakes and make your crawl space less appealing to them. If you feel you have to catch the snake yourself, there are safe ways to that as well. A snake living in your crawl space could soon move into your home in search of food. Remove the snake's food sources. Set up several mouse traps in your crawl space to catch rodents raiding your pantry. Move any bird feeders in your yard far away from the house, as rodents may eat the spilled bird seed. Rake up any mulch that you have in the immediate area around your home. Substitute gravel mulch for any bark, wood or leafy mulch. Place mothballs around the opening of the crawl space and a few inside the crawl space itself to repel snakes and rodents. Don't use too many mothballs inside the crawl space or you will probably smell them inside the house. Place two or three damp burlap sacks inside the crawl space. Cover the damp sacks with several dry burlap sacks. The pile of sacks will be a nice den site for the snake, and it may curl up underneath it. Lift the entire pile out of the crawl space with a shovel once you think the snake is under the sacks. Be careful not to injure the snake when you wedge the shovel underneath the pile. Set glue boards inside the crawl space. Check on the glue boards several times a day to see if you've caught the snake. Lift the snake and glue board out of the crawl space with a shovel. Walk a safe distance from your house, then set the glue board and snake on the ground. Pour some vegetable oil over the snake to free it from the glue board. Look for any holes or large cracks that the snake was using as an entrance to the crawl space. Cover any holes with plywood, and fill in any cracks with silicone caulk. Richard Toole started writing for eHow in 2007 and enjoys writing about a fairly wide range of topics, including sports, hunting, health and fitness, music, and cooking. Toole first got into writing during college at the recommendation of a professor. He graduated with a Bachelor of Arts degree in writing from Methodist University.